12-month core inflation rose to 2.4%, the highest number since September 2008. Non-seasonally adjusted inflation was essentially flat, meaning minimal principal increases for TIPS and little change in the six-month total that will reset the I Bond variable rate. 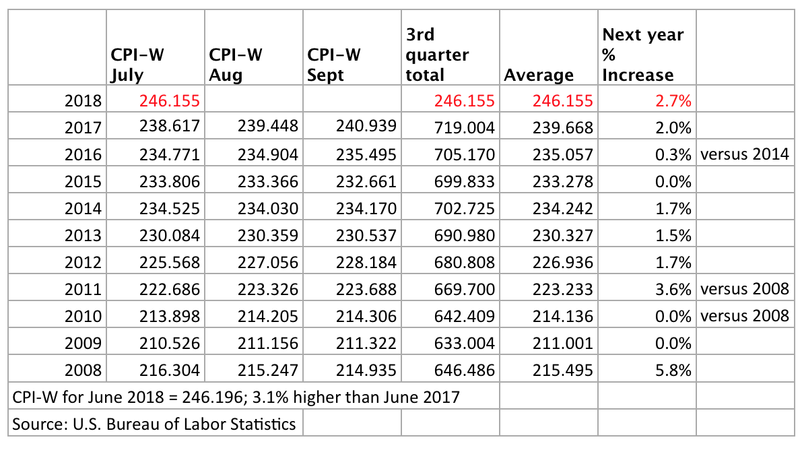 CPI-W was also flat, marking the first month of the three-month period that will set Social Security's COLA for 2019. The Consumer Price Index for All Urban Consumers (CPI-U) increased 0.2% in July on a seasonally adjusted basis, the U.S. Bureau of Labor Statistics reported today. Over the last 12 months, headline inflation rose 2.9%. The July numbers matched the consensus estimates, so the market reaction should be sedate. Core inflation - which strips out food and energy - also rose 0.2% in July and is up 2.4% over the last 12 months. The core inflation numbers also matched the consensus estimates. A significant factor in the July report is that inflation continued rising even though energy prices declined. Over the last year, gasoline prices have been pushing inflation higher, but in July gasoline prices fell 0.6% and the overall energy index was down 0.5%. But the shelter index rose 0.3% in July and accounted for nearly 60% of the monthly increase in the all items index, the BLS reported. Food prices rose a moderate 0.1% in July. Holders of Treasury Inflation-Protected Securities and U.S. Series I Savings Bonds are also interested in non-seasonally adjusted inflation, which is used to adjust principal balances on TIPS and set the future inflation-adjusted variable rate on I Bonds. The BLS set the July inflation index at 252.006, up just 0.01% from the June number. In practical terms, non-seasonally adjusted inflation was flat for the month. This is the reverse of recent months when non-seasonally adjusted inflation was running higher than the adjusted number. These variances balance out over 12 months. For TIPS: Principal balances for TIPS will be adjusted higher by 0.01% in September, after rising 0.16% in August. Here are the new September inflation indexes for all TIPS. The 2019 cost-of-living increase for Social Security will be determined by the average of the Consumer Price Index for Urban Wage Earners and Clerical Workers (CPI-W) over the months of July, August and September. I explained this process in a recent article: "Social Security COLA Looks Likely To Top 3% In 2019". July's report reflects moderate inflation, but "solidly moderate." Inflation is rising well above 2.0% a year for both the headline and core numbers, and overall inflation rose in July even though gasoline prices declined. The increase of 2.4% in core prices is the highest number since September 2008. The latest gain is likely to reassure the Federal Reserve as it considers raising interest rates-it has penciled in two more increases for this year-to keep the economy on an even keel.